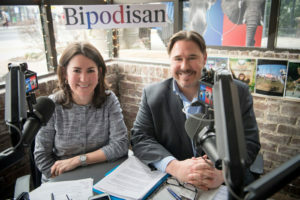 On this week’s episode of Bipodisan, Paul, Jean, and Moe stay in the dugout at Chatter Bar and Grill and talk about the outrage machine’s reaction on both sides to the Trump-Kim handshake in Singapore, the argument for being hopeful on North Korea, and the scene from the baseball flick Bull Durham that best captures Donald Trump’s style (hint: it involves a bull). Meanwhile, Mary Kate heads to Nationals Stadium and steps up to the plate as a roving reporter, interviewing Members of Congress at the annual Congressional Baseball Game about how to have more civil conversations and build bipartisanship. Plus, why singing Capitol Hill cops, local political engagement, the World Cup, and a gracious moment from a high school pitcher are making us hopeful.